We are one of the oldest festivals in the country. A 5 day festival extravaganza packed with entertainment for all age groups to enjoy in a fabulous location. 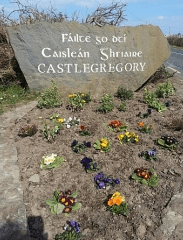 The castlegregory summer festival will take place 9th to the 13th of july. The summer festival is known far and wide for family entertainment .there are lot of events geared towards family involvement, including summer festival queen selection; dances and discos with pet show and family amusments and of course treasure hunts and much much more. The Summer Festival is held each year on the second weekend of July. It is organised by Castlegregory Community Council. to encourage locals and visitors to come together and participate in a action packed fun programme of entertainment and activity. The Summer Festival is known far and wide for its family entertainment. There are lots of events geared towards family involvement, including: Children and Adult Fancy Dress Parades; Sand Castle Competitions; Children’s side shows; Summer Festival Queen Selection; Tennis Competition; Dances/ Discos; Pet Show; Treasure Hunts; Family Fun Day; Amusements and lots more…. The number of people who book their holidays year after year at festival time is remarkable. It is one of the oldest festivals in the country and has been in existence since 1948 and is still going strong today.